Camping village Dionysus it was just the perfect place for us, we have been there just two days but we are sure we will go back soon. The Bungalow's area is amazing and comfortable, toilets are in a very large building, clean and tidy. We also enjoyed the pool and the kitchen area. Very good bus connections just outside the camping. The host was also very friendly and responsive to every request. Everything was really nice. People were very friendly, they helped us with everything we need. Not too many people so it was a quiet place in the end. The place is very beautiful, in the middle of a olive tree forest. The staff was very nice and welcoming. I was only there over night, but our bungalow was clean and the bar was welcoming and fun. It was a fantastic stay in a bungalow. The staff was very nice and helpful and the facilities as the restaurant and the swimming pool were brilliant. The only negative aspect is that you have nothing to cover yourself during the nights, that they have a very slow wifi signal (it doesn't reach all the camping) and I will illuminate more the roads during the night. Overall, it was fantastic and if I'm going back I will choose Dionysus Village. 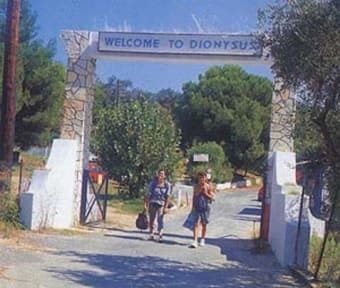 If you're a fan of camping and happy to walk, Camping Village Dionysus is a great place to stay. It's on the bus line, so is easy to get to, the huts are great (you have the floor space of a reasonable sized tent but you can easily stand in it), it's solid, it's protected with netting from bugs and they provide a padlock for security. The bathrooms and showers were very clean, there is a nice pool and a restaurant available. Easy enough to get to from the airport - just a couple of bus rides and it takes you right outside the camp grounds. We stayed in one of the huts - it got really hot at night because there weren’t any windows. There was one outlet - next time I would bring a fan! The restaurant was fantastic, great food and really nice staff, the pool was amazing, bathrooms were ALWAYS clean. Make sure you have cash - the wifi isn’t good and the card machine didn’t work at reception. Staff are friendly and helpful. Easily accessible by bus from Corfu town Cabins are very small and basic, but clean and comfortable. A great place for the price. The staff wasn't very helpful about the local area and sites/ beaches to see, the WiFi didn't work well at all, and we were eaten alive by mosquitos. Nice bar area, decent pizza and clean bathrooms. I'd definitely stay again for the price. Really cool place to just relax, the pool is really nice and clean. The food is really good and the stuff it’s extremely nice, bar and restaurant staff in particular. The bartender is awesom, really fun. It’s not a good place to meet other people, it’s more of a family place but it’s really nice to just chill. The area around isn’t nice at all.